“As these sheets will never appear in the form of a book, and I have not the fear of the Reviewers last before my eyes . . .” writes a wise older friend in the introduction to a novel written to a young woman in the middle of a years-long lawsuit. Another young woman writes a novel in 1799 as a gift to a friend she loves so much that over forty years later they will be buried side by side. These novels—and many others—survive in single copies, often all-but lost in the corners of unlikely archives, never brought together. Until now. This project will create a vocabulary and taxonomy for discussing manuscript fiction in the age of print (c.1760-1880). While significant and exciting research has been done on the process of manuscript circulation and “publication” by scholars such as Margaret Ezell, Harold Love, and others following in their wake, those accounts of manuscript culture do not extend themselves very far (if at all) into the eighteenth century. 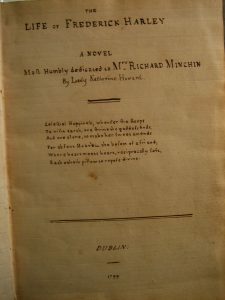 Moreover, studies of later eighteenth and nineteenth-century manuscripts concentrate on those that achieve fame by association (the Brontë juvenilia, the Dickinson fascicles, the working manuscripts of various published authors) or those that have value as social documents (friendship books, copybooks, etc.). The 2015 conference “After Print: Manuscripts in the Eighteenth-Century” at the University of California Santa Barbara gathered together those interested in manuscript in this period, but most of those researchers worked on manuscripts that ultimately saw print, political, or scientific nonfiction, and the literary form most common in manuscript culture: poetry. Where is fiction in manuscript during the age of print? While difficult to find the archive, it exists, and I collect it. Since 2009, I have collected examples of what I call “manuscript fiction”: a term I use to describe works (complete or incomplete) of fiction that survive during the age of print culture, despite never seeing print. (You can see my early work on this here). Some are found in the archive bound and resembling print in sizes ranging from heavy tomes to tiny packets, while some survive only in fragments. Some resemble print editions closely and include elaborate title pages, while others are barely decipherable without intense deciphering. Some contain chapters and a clear plot, and some ramble in ways worthy of Smollett or Richardson (or are, indeed, parodies of those famous novelists). Some are written by those famous in other fields (such as playwright/actor Charles Dibdin or Governor-General of India, Warren Hastings), while some linger just on the edges of the historical record. While a few may have been imagined as future printed books, none of them made that leap. Most challenging, none of it appears in obvious ways in any cataloguing system. I currently have thousands of pages of this material from the American Antiquarian Society, Chawton House Library, the National Library of Scotland, the British Library, and the London Metropolitan Archive. At the time of this writing, I am preparing to collect more examples from the University of Pennsylvania, the New York Public Library, and Princeton University, and I know of examples at Newberry Library and Yale University. From meticulous searching of various finding aids, I also have evidence of more in various libraries, public records offices, and other archives in the United Kingdom and the United States. Together, this growing collection provides exciting and illuminating insights into the writing and reading lives of the period. Thanks to in-kind support from Auburn University’s College of Liberal Arts information technology and digital projects departments, as well as internal grant funding from the College, a two-year University-level seed grant, and support from the Caroline Marshall Draughon Center for the Arts & Humanities, I am creating a database that includes full-text transcriptions of these texts. These texts will be fully encoded according to best practices so that they can be used for the full range of digital projects, including easy interface with many other projects in eighteenth and nineteenth-century studies, such as the aggregation tools 18th Connect and NINES. The first phase will use the currently collected material to create a text-only proof-of-concept database, designed to include later images of the manuscript pages themselves in another phase if possible. 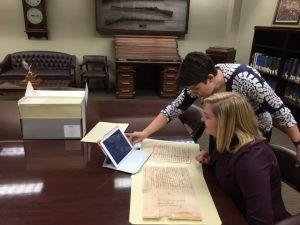 In fall of 2016 Auburn’s metadata specialist Dana Caudle has pledged at least 40 hours of her time to create the data dictionary that is the foundation of the project. During the 2016-17 academic school year, I will be training (with assistance from Dana) both undergraduate and graduate students in the finer points of transcription, TEI markup, and metadata tagging. One student, Kelsie Shipley, was awarded an Undergraduate Research Fellowship, while others are members of my year-long Honors Research Seminar and will receive course credit for their contributions to this project. In the summer of 2017, I will return to the UK to access relevant manuscripts I know to be in the collection of the Yorkshire Archeological Society. The holdings of the YAS are being moved to the University of Leeds and will not be available in any form until the transfer is complete in 2017. I am hoping by that time I will have still more leads for further collection. This is the challenge of this project: because these are works that are not often catalogued specifically in library holdings, I often rely on word of mouth from the knowledgeable archivists and librarians who know their collections. This entry was posted in Collections, Digital Humanities and 18th-Century Studies, Women's Lives in the 18th Century and tagged digital humanities, fiction. Bookmark the permalink. Emily C. Friedman is the author of Reading Smell in Eighteenth-Century Fiction (Bucknell 2016) and an Associate Professor of English at Auburn University. Her research explores the spaces between genres, especially theatre and the novel, issues of reader experience, and the definitions of public and private writing. She is now at work on a monograph and database project, tentatively titled Manuscript Fiction in the Age of Print, 1750-1880.